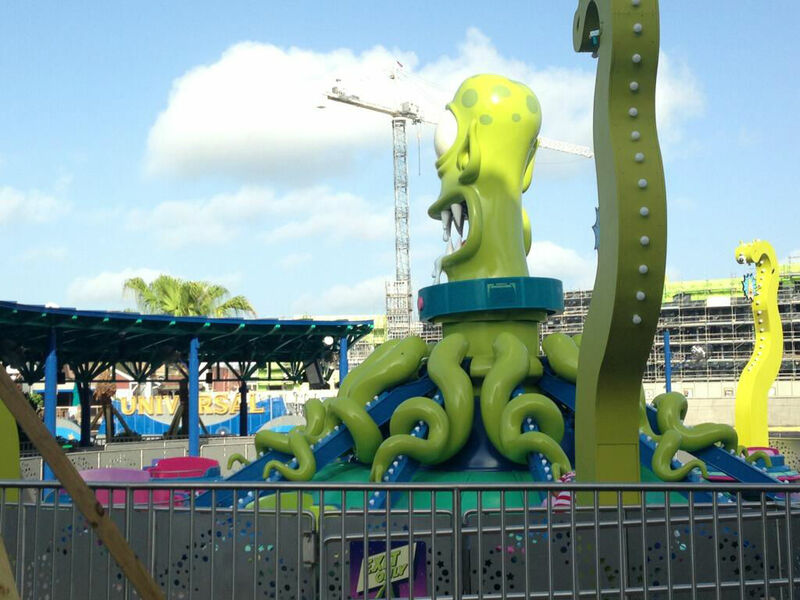 One of the last pieces of Universal Studio Florida’s expansion of Springfield USA is almost ready for guests as the construction walls for the Kang & Kodos’ Twirl ‘n’ Hurl spinner ride have been taken down. Team members were being vague on when the ride itself will be open to guests, only saying “within the next week.” Testing for the ride has been going on for weeks. First there was testing with the ride empty, then with water dummies, and finally team members themselves have been testing the ride over the past several days. 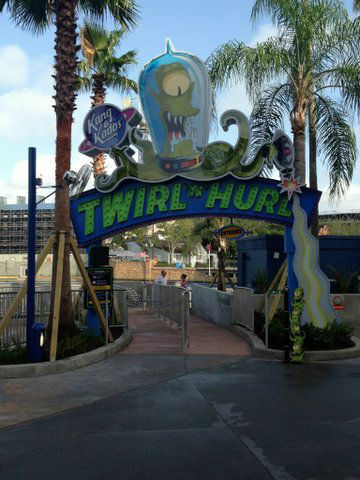 EDIT: As of noon on Sunday, August 11, Kang and Kodos’ Twirl ‘n’ Hurl is open to guests. Like The Simpsons Ride, the queue for Kang & Kodos has televisions that play a clip package featuring moments from The Simpsons television show that feature encounters with extra terrestrials. 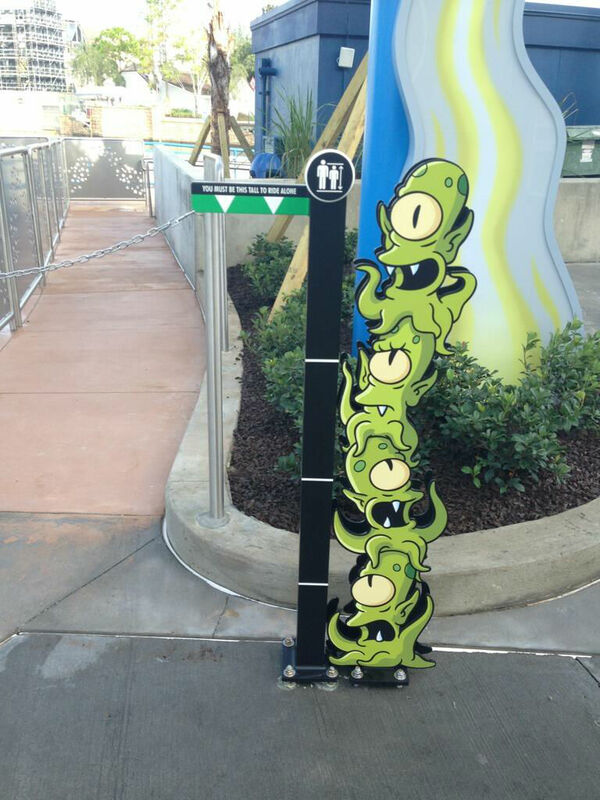 Everything is well themed, including the height measurement stick. There is no height requirement to ride Twirl ‘n’ Hurl, but guests under 48” must be accompanied by a supervising companion. The ride itself is very similar in operation to One Fish, Two Fish, Red Fish, Blue fish over in Seuss Landing. 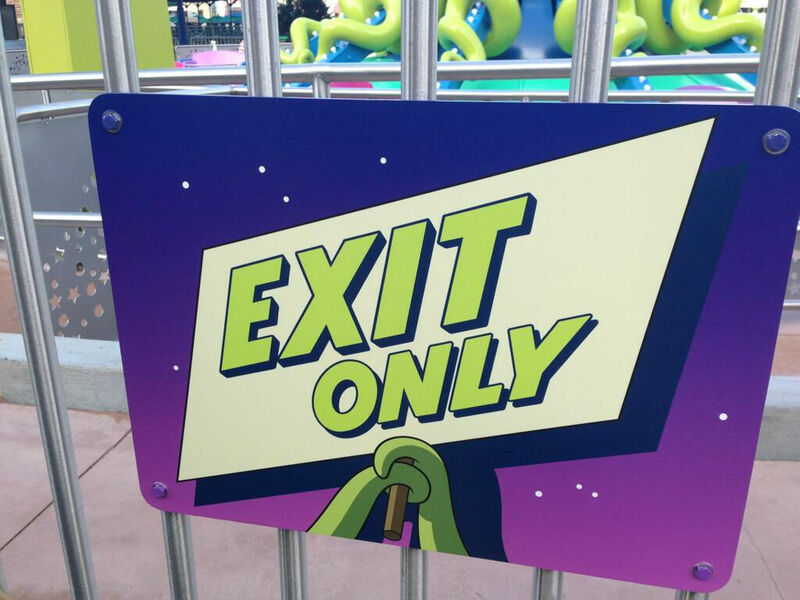 Each spinner has a control allowing the guest to take the spinner car up or down while it is going around; however, this movement also activates specific sound bites from Kang ‘n’ Kodos. 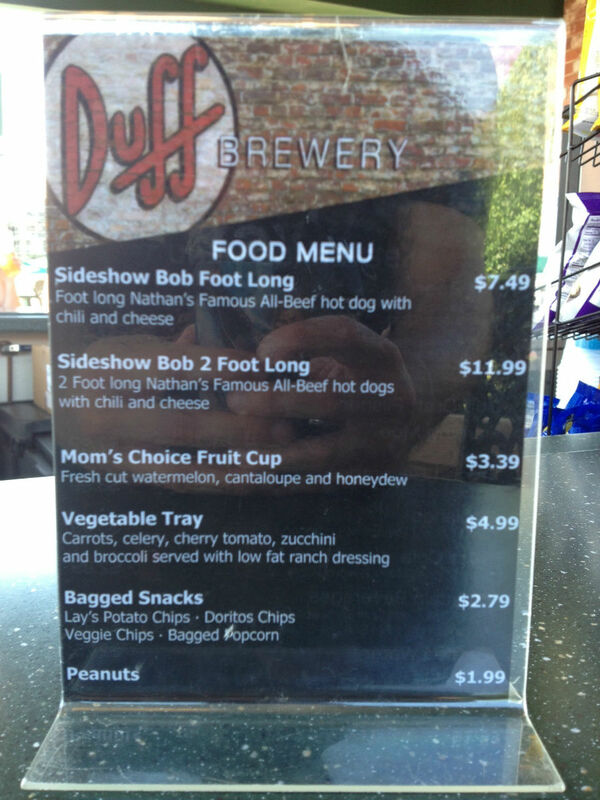 In another part of Springfield USA, the Duff Brewery has gone through a slight menu change. The menu used to feature a “Heat Lamp Dog,” a humorous title for a foot long Nathan’s famous all-beef hog dog with chili and cheese, but that is now being called a “Sideshow Bob Foot Long.” The price is $7.49. They have also added an option for “Sideshow Bob 2 Foot Long,” which is two separate Nathan’s hot dogs, both with chili and cheese. The price for this is $11.99. You can still get a “Heat Lamp Dog” at Krusty Burger.